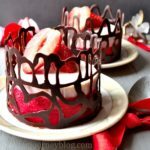 Strawberry desserts are so popular on Valentine’s day! 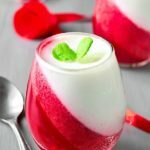 This is one of Valentines desserts that is healthy, tasty and easy to make. 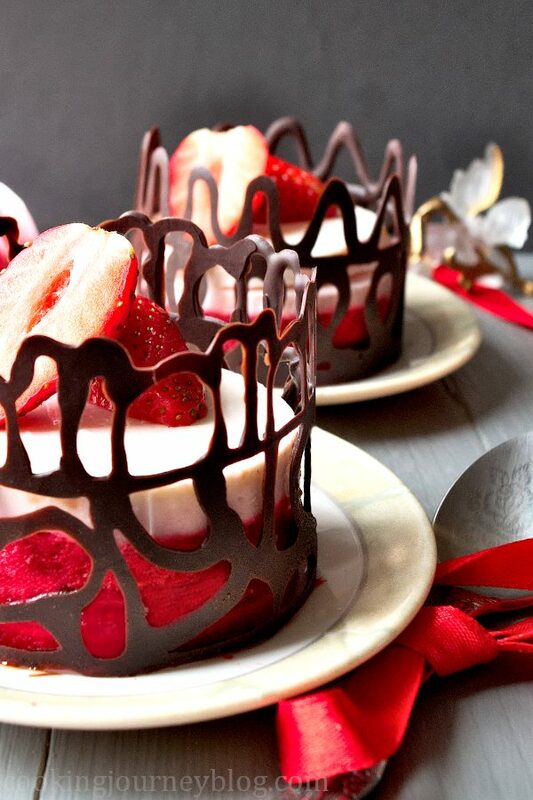 Surprise your loved ones with these elegant strawberry no bake desserts! This beautiful strawberry cake is a perfect conclusion of fine dining. And this is pretty easy recipe, too. These strawberry desserts have no pie crust, so they are perfect for gluten-free diet. You need only 5 ingredients to make this dessert for two! Main ingredients are frozen strawberries to make red layer and Greek yogurt for the white layer. 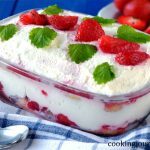 I’ve made this sugar free dessert, because I love natural aromatic taste of strawberries and natural taste of Greek yogurt. If you want to make it sweeter, you can add 1 tsp of caster sugar to the yogurt, when you add gelatin. Moreover, you can adjust the flavor with the addition of vanilla bean paste. You can also use cream cheese instead of yogurt. 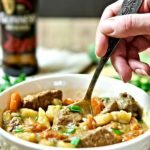 It is naturally more thick, so you will need less gelatin – about 7 grams or 0.25 oz, which is approximately 2,5 teaspoons of gelatin. Strawberries, yogurt and chocolate – tasty and healthy combination. Think of strawberry cheesecake? No, this dessert is better. I used frozen strawberries this time of the year. However you can blend fresh strawberries, too or substitute to other red berries such as raspberries or pitted cherries. If you are wondering what to prepare for entree, check our Yogurt Strawberry appetizer, Strawberry Pizza or Summer salad. 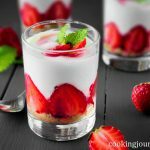 We also have more dessert recipes, such as Strawberry tiramisu and Easy strawberry desserts in glass. Or if you’re in a mood of baking strawberry pie, you should check our Strawberry tart. Why sweet strawberries? Not only because they are red, but also this berry is a symbol of Venus – the Roman goddess of love. Now you can present these Valentine’s desserts with more meaning! Moreover, if you want to make this recipe with agar agar instead of gelatin, you can check our Coffee panna cotta or Orange panna cotta recipes. Using agar will make a vegetarian-friendly version of these Valentine’s desserts. To make healthy desserts, heat agar with milk for about 5 minutes, then add to the Greek yogurt. To thicken strawberry layer, heat agar in water for 5 minutes, then add to blended strawberries. It is usually measured 1 tsp agar agar powder per cup (250 ml). 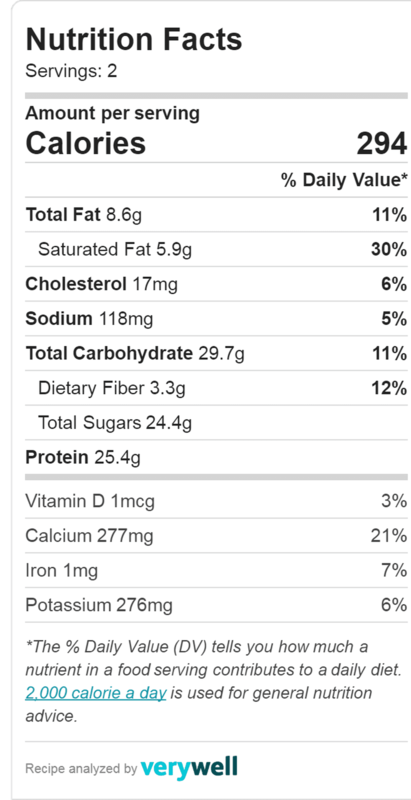 I would recommend to add 0,5 tsp more to strawberries, as they may be quite acidic, which can influence thickening process. Chocolate is another symbol of Valentine’s. You can get creative with chocolate patterns! Decorating pen is very useful for this job, but you can use piping bag too. If you want your chocolate to look more glossy and crunchy, you can temper it. I described tempering method in blog post about Black Pearl. But just melting chocolate will be fine too. I would recommend making few more chocolate decorations, so that you can choose the best one. Moreover, you will have something for the replacement, as they can be fragile. Anyways, be careful, when handling your creation! By the way, store chocolate away from humidity, fast temperature changes and warm surfaces. 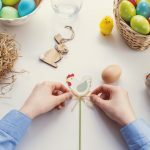 You can prepare chocolate decoration ahead of time. Ideally it should be stored with temperature 65-68 F or 18-20 C degrees, with humidity 50-55 % humidity. This will prevent chocolate from changing color. But it’s more important to handle it carefully, so if you make it first time, don’t make lines too thin. I didn’t use special pattern for these strawberry desserts. If you want to be more precise, you can draw with pencil different pattern that you like, then go over it with chocolate. First draw long rectangular. Then start filling it with lines, hearts, circles etc. It is important to have small gaps between the lines and that the lines connect with top and bottom line of your rectangular. After that draw some waves, connecting the top of rectangular – this will be the top of the basket. Then just wait for it to “freeze” at room temperature and gently peel off the paper. You can adjust some parts, gluing them with melted chocolate. 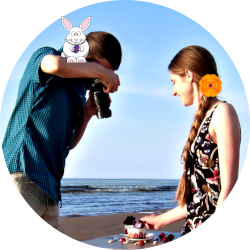 Draw different design ideas with your family members or loved ones. 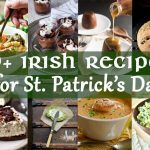 Have fun, creating Valentine’s desserts together! By the way, you can serve strawberry ice cream in these chocolate baskets. To decorate these easy strawberry desserts, use fresh berries. 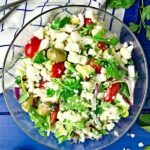 You can add whipped topping, chocolate chips and mint leaves. Or decorate with chocolate covered strawberry! 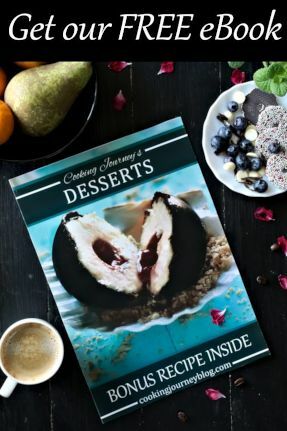 If you have any questions about making this dessert, feel free to ask in the comment section below. We will be happy to answer! If you make this recipe, share the picture with us. If you are looking for more Valentine’s dinner ideas, check our Cauliflower Casserole and Poached pears, these are great appetizers for two. Wonder what to make for breakfast? 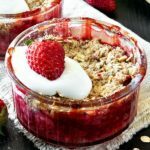 Try this Strawberry Rhubarb Crisp. These are lovely healthy desserts for breakfast! 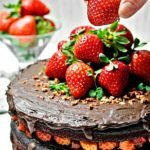 Hope you’ll try this strawberry chocolate dessert and make a happy food dance! 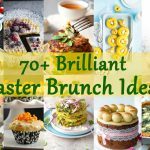 Stay in touch for more delicious ideas every week! Strawberry desserts are so popular on Valentine’s day! 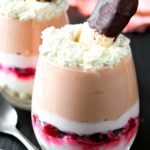 This is one of Valentines desserts that is healthy, tasty and easy to make. 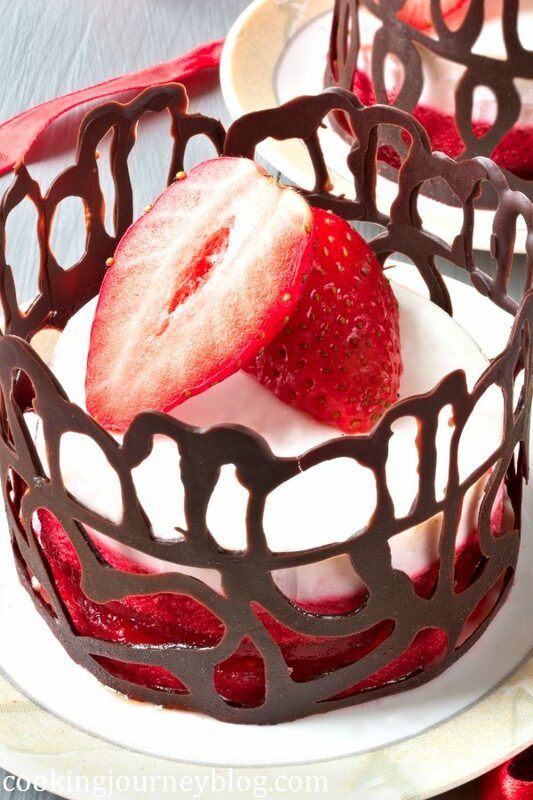 Surprise your loved ones with these elegant strawberry no bake desserts! Heat strawberries in a separate pan for 5 minutes, until starting defrosting. Or defrost at room temperature for about 2 hours. Blend strawberries with liquid (from defrosting) until smooth. Heat gelatin with water until melted. Blend strawberry mixture with melted gelatin. Layer 7x 11 inch pan with cling film. Add strawberry mixture and leave in the fridge until set. Leave 10 g gelatin in 2 tbsp water to bloom (about 10-15 min). Heat 100 ml milk (don't boil) and mix it with gelatin until it dissolves. Mix Greek yogurt with 100 ml milk. Slowly add milk with gelatin in Greek yogurt and mix well. Pour yogurt mixture on strawberry layer (when it is already set) and leave in the fridge. Cut 2 rectangular pieces of parchment paper that you can wrap around food shaping mould. Fill decorating pen or piping bag with melted chocolate. Draw long rectangular at first on a parchment paper. Fill it with hearts and lines, connecting top and bottom line. Draw the waves, connecting the top line of rectangular. Leave drawing for about 10 minutes until you can lift it. Wrap parchment paper without drawing around food shape mould. Carefully wrap paper with drawing as a second layer, drawing inside. Leave until set. Carefully remove paper from outside. Remove the mould. Unwrap the other side of parchment paper. You can glue the baskets with melted chocolate, if needed. Remove the layered dessert, lifting the cling film. Use food shape mould to cut the 2 rounds. Place them on a serving plate. Sweet and healthy treat for your healthyish sweetheart. Thanks! Woow! This is the fanciest dessert I’ve seen in a long time! So pretty! 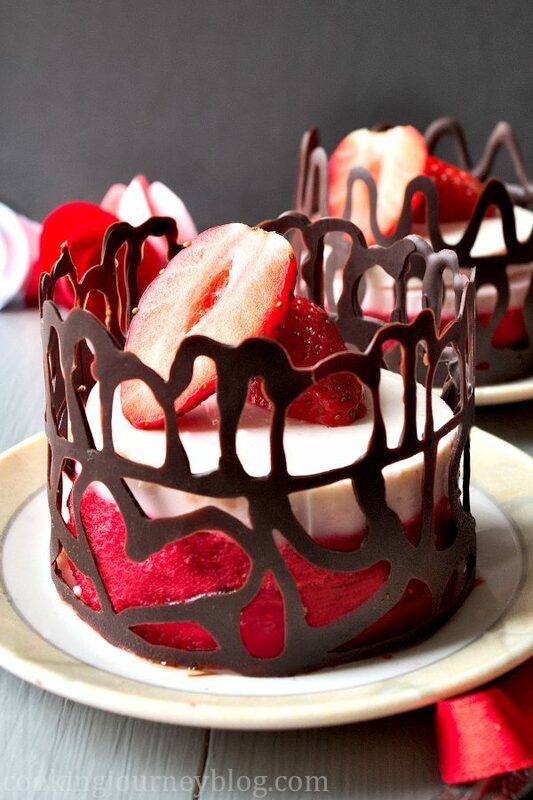 This is a pretty dessert perfect for valentine’s. I mean who wouldn’t love these beauties. I would. Strawberries and chocolate win-win. Yum! Absolutely! These strawberry desserts are perfect for breakfast and light for dinner. This is such a beautiful dessert. I can’t believe how simple the layers are and I love yoghurt so perfect!